Published: May 7, 2015 at 12:39 p.m. Updated: May 8, 2015 at 12:07 p.m. This is the most serious thing ever! The draft is over and many of us are wondering "what the heck we're supposed to do with ourselves now?" Well, maybe you are. I mean I have the best player in Major League Baseball patrolling centerfield just minutes from my house, "Mad Max" "Jurassic World" and "Magic Mike XXL" (what, you're not a fan?) on the horizon, too. So there is a lot to get through between now and the start of the football season. But I guess it wouldn't hurt to have one quick look at the incoming prospects as we figure out how they will factor into the 2015 NFL season. My quick prediction is Melvin Gordon will be the most over-drafted rookie. Which is fine. I remember how many people were stoked for Ryan Mathews as the replacement for LaDainian Tomlinson years ago. Not to mention the history of failure from Wisconsin running backs. And the Chargers offensive line has been pretty bad the past couple of seasons. Orlando Franklin will help, but that offensive line was brutal last year. BRUTAL. So have fun with all of that. 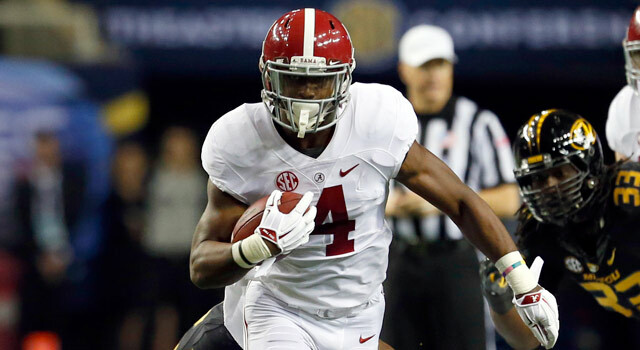 One rookie I would love to have is T.J. Yeldon. I love the move for Jacksonville. They have an immediate need for an every-down running back. I'm a little biased because I watch a lot of SEC football out here (and I don't get the Pac-12 Network, which is a horrible situation). I had kind of rooted for the Cowboys to grab him in the draft to go behind their amazing o-line. But that was not to be. Yeldon was injured during his senior season at Alabama. But that's cool. I will go back to his rookie season when he became the first true freshman to rush for 1,000 yards. Oh yeah, he did this while he backed up Eddie Lacy, too. The Jaguars, like the Chargers, have had troubles with the offensive line, too. But I really like the acquisition of Jermey Parnell who played well for the Cowboys as a backup to Doug Free. Stefen Wisniewski could be a real find at center. A.J. Cann was a steal and he'll end up as a starter this season, too. Plus the team signed Julius Thomas to make the offense even more dynamic. And if you read Mike Silver's excellent work from the Jaguars war room, he got some real insight into how Gus Bradley really wants to run the ball this season and how much he really wants a featured back to carry the load a lot this year. So I will feel very comfortable with Yeldon this season. Just chill out a little bit when somebody jumps in on Gordon in the second round (you know it's happening). Endure the chuckles when you select a Jaguars running back (you know that [expletive] is happening). And be ready to laugh last and scream Duuuuuuval! every time this young man scores a fantasy touchdown for you. Trust me. Are you ready for some more of my likes and dislikes from the 2015 NFL Draft and the subsequent fallout? Jameis Winston is going to be the top rookie quarterback this season. I know, contain your surprise. But with guys like Mike Evans and Vincent Jackson, Winston will have the chance to make a huge impression early. I'd use him as a QB2. Marcus Mariota might be the better pro quarterback at the end of the day. (And I have no idea what that day will be.) But just who is he going to throw the ball to this season? He should only be drafted in dynasty leagues. That's it. Although, I do expect David Cobb to be his running back in Tennessee. You hear the downhill running thing thrown around a ton by people who might or might not know what they are talking about. So take that for what it's worth but they say it a lot for Cobb who rushed for like 5K last year (you might want to double-check the math). Actually he set the school record with 1,626 rushing yards last year with a line that was kind of dookie. The Titans have a solid o-line. Todd Gurley is going to be this year's Josh Gordon in the sense many folks will draft him with the hopes he's going to be strong during the playoff push. And that's a pretty damn good idea. Gurley is one of the best running backs to enter into the NFL in recent years. YouTube his game against Clemson last year and you're going to be smitten. Tevin Coleman is going to be very interesting. He's got a great opportunity to open the season as the starting running back for the Falcons this year. And this draft selection has Kyle Shanahan's finger prints all over it. And the younger Shanny has never shied away from going with a rookie running back, as evidenced in Cleveland last year and Washington years ago. I really liked Ameer Abdullah at Nebraska. He was fun to watch. So I was a little invested when he had a nice combine and was excited to see where he ended up. And I kind of dig him going to Detroit. The comparisons to Reggie Bush will be inevitable, but expect him to have that kind of role. We should all thank Doug Martin. Because if people get all, "who was the last Boise State running back who did anything in the NFL?" we can be all, "Doug Martin." So now I don't feel bad for digging Jay Ajayi. But Lamar Miller is still coming off a good season and he's in the final year of his contract so there is going to be a lot of upside for Miller. I still like Justin Forsett this season. If for no other reason, he was great last year. But I also filmed a skit with him this offseason (as I did with many NFL players). Forsett was the only one who learned his lines ahead of time. That was pretty impressive. So I'm extremely biased. But I really like Forsett again this year because of his attention to detail. Darren McFadden also starred in one of those Random skits, and he was great, too. So now I'm biased towards him. But dude, that offensive line. It's not silly to take a chance on McFadden. Just make sure you have Joey Randle on your team, too. That's just smart business. Hot damn, Jonathan Stewart did some work on the Random NFL series. (This is seriously ruining my rankings.) Again, I won't say anything bad about the Daily Show. But if you do select him, you need to grab Cameron Artis-Payne as well. That's just smart business. I wish more NFL teams (or sports teams in general) utilized the 'rival shows up on the jumbotron' to rattle opponents. Like if Peyton Manning was about to lead the Broncos for a score, but Tom Brady showed up to taunt him and say [expletive] like, "you'll never win a championship." And then Manning throws a game-crippling pick. That would be rad. Image"RAW" was pretty rad this week. I was most happy Dean Ambrose actually won a match. A match that threw him into the main event of the latest PPV (just $9.99). I mean sure, he's there just to get pinned, but he's back on the main event landscape which is a nice touch. New Day is also one of my new favorite things in the world, too. They have a clap you can immediately mock. They use "Freebird rules" (even if Booker T doesn't quite understand what that means). And the three of them actually beat two guys, which never seems to work in WWE math. Sami Zayn! More "RAW" shows like this, please. As always, I implore you to read Brandon Stroud who has a new theory on "The Shield" I want to come true so much. Well this shouldn't be a surprise to many of you, but Kevin White is my favorite rookie receiver for the coming year. But my man Marcas Grant said it best when he pointed out White is really in a position to be this year's Mike Evans, but with a better quarterback. That seems fair. I'm scared of Amari Cooper, mostly because the Raiders drafted him and I'm now conditioned to cringe when the Raiders take somebody I like. But I truly believe the Raiders are close to turning a corner with Derek Carr. But I'd still put him behind White. I'd be cool to have Nelson Agholor on my squad. He's the prototype of Chip Kelly receiver that you'd expect him to seek. For fun, I looked up his high school recruitment page. Oregon had interest. But the Ducks were way down on his list. Hope there are no hard feelings. I did watch a lot of Arizona State games this year and I loved Jaelen Strong's game. Just look at the move he made on the final play of the game against USC. I guess the knock on him is his work ethic. But this was a pretty big steal for the Texans who can now just line him up opposite DeAndre Hopkins and let them get busy. I like DeVante Parker, but I feel he might get lost on the Dolphins with Jarvis Landry and Jordan Cameron. I know, it seems weird to say the Dolphins are now loaded with receivers! But do consider how much this could mean for Ryan Tannehill this year. Image"Justified" finished up its successful run with one of the best finales I've seen in quite some time. Maybe it's because shows like "Dexter" or "Nip/Tuck" went out with such a thud, anything more than a complete disaster seems great by comparison. But "Justified" stands up with just about any lens you place it under. It's one of those shows that stayed true to itself and offered a satisfying conclusion to the story. I'd put it ahead of the "Sons of Anarchy" finale, but it still trails "The Shield" as the all-time best ending to a series, ever. I'm going to buy into the Maxx Williams hype. You know why? The Ravens drafted him. That's typically pretty good for me. I know Ozzie sometimes has trouble with the receivers. But I like Williams a lot. ImageAnd some quick love for Chicago on a great draft venue! Chicago knocked it out of the park and should be on the very short list to host it every year. If not every year. San Diego should get it one year. New Orleans would be amazing. But stay with me here. The NFL Draft should be held in (wait for it) Las Vegas. The NFL could completely take over Fremont Street. The draft venue could be held at Thomas & Mack center. This idea makes way too much sense. Also some love for the following folks for making Chicago amazing. Giordano's Pizza. Amazing pie, and free WiFi! I love it. Potbelly Sandwich Shop. Tap Works in Greek Town. And Chicago in general. (I wanted to do a dub-style reading like Bradley at the end of "40 oz. to Freedom", but I cut it short here. A motivated Tom Brady is going to be the kind of quarterback I would like for my fantasy league this season. Remember the last time the Patriots name was besmirched? He went out and threw 50 touchdown passes. I'm not saying he's going to do it again, but damn, don't wake the dude. Does this mean Rob Gronkowski is the beneficiary who ends up with the 20-plus touchdowns like Randy Moss? Perhaps. I'm impressed Jameis Winston poked fun at his haters by posing with crab legs after the draft. Or at least I'm impressed by his handlers. But he (and his advisors) must realize the reason we are dubious of Winston is not because of the crab legs incident. I'm a fan of Zach Mettenberger and I'm biased when I say I wish he would have been given another chance to be the quarterback of the future for the Titans who would have been better with him and the bounty they would have received from the Eagles. The Titans clearly have the buyer's remorse on Bishop Sankey, though. Hey man, it's better to just move forward and be done with it instead of trying to make it happen when it really isn't there. Kind of like the proposed Manny-Mayweather rematch. Look, it was pretty lousy the first time we saw it, and I've seen no indication things are going to improve the second time around. In fact, I expect it to be worse. So let's just put it all behind us and move forward. But dog damn it; I like Tre Mason a lot. I really thought he was going to take a step forward this season and be a first-round fantasy pick. Now, not so much. I mean, if Gurley starts the year on the PUP list, Mason is the kind of guy you can steal after you have put together your starting roster. But he's not going to be the belle of the ball as I figured he would be. Son of a biscuit, can't any of the guys I like get a chance to succeed? I really liked Devonta Freeman headed into his rookie season. I liked him a ton headed into the offseason when the team resisted any of the RBs in free agency. So I kind of watched the draft with my eyes closed like it was a horror movie because I want my guys like Mason and Freeman to make it. Oh my gosh, Joique Bell! NO! Ah, just kidding. Actually, Bell shouldn't see much reduction at all. He's still going to be the (wait for it) bell-cow running back for the Lions. Abdullah will make the offense more dynamic, but Bell will still be the dude who gets the ball near the goal-line and on the early downs. I know a lot will be made about Ajayi and his knee which caused him to fall to the fifth round. But you're not the one investing millions in him. You're going to need him for one fantasy season (unless you play in a dynasty league), maybe just a few games. So you don't need to overly concern yourself with his knee (which is kind of bad). I'd just take Buck Allen as kind of a handcuff. Actually, I guess there is no other way to really take him. I mean, I like Forsett a ton, and I will end up with him. So that would make Allen the guy I'd take a flier on very late in drafts. If somebody wants to get cute and snag him a bit earlier, well, I'm not going to lose any sleep over it. I will remind you one more time, I'm going to be very biased towards McFadden this season. But if the Cowboys didn't select a running back in this draft, can't we just conclude the team is very comfortable with their backs going forward? Am I totally wrong here? ImageI'm excited for a new voice for "The Daily Show", that being Trevor Noah. I'm disappointed people have already gone out of their way to dismantle his credibility before he even has a chance to warm the host seat. What are we doing, people? Tony Romo was maligned this offseason. I have no other editorial to offer other than that. But this time, it was because he said his team was going to win the Super Bowl. Why are people taken aback by that? Every quarterback should enter the season with the expectation to win the Super Bowl. I mean most quarterbacks other than Geno Smith. But most of them should. ImageDamien Sandow has now fallen into the career abyss. The WWE does such a great job with some storylines, but others just fall flat. The blowoff for the Sandow and Miz feud should have happened on a PPV, not over six weeks on RAW. I see nothing wrong with using enhancement talent to advance storylines. I mean, doesn't Sandow look like a much more credible threat if you see him wasting jobbers for a month. It's akin to a team getting on a hot streak headed into the playoffs. I don't get why the WWE misses this most of the time. BTW George Farmer, dude, what were you thinking? I know we probably won't hear the real story. But you could have been the Agholor of the Trojans this season. Instead, you're a walk-on free-agent who signed with the Cowboys. Actually, that might not be so bad. But still not enough to take him seriously in fantasy football. There were a bunch of track stars converted to NFL players during the 1980s. It was the rage. Breshad Perriman is kind of like that. He's superfast, but he drops the ball a lot. Kind of like Orlando Jones' character Clifford Franklin in "The Replacements". I have the suspicion Dorial Green-Beckham will be over-drafted because people will be thinking they are getting Odell Beckham Jr. or something. But the thing that scares me the most is he's played just 25 college games. He's way too raw, especially with a rookie quarterback. Devin Funchess is interesting, too. I like what the Panthers are doing with the sizeable receivers. How very Chargers of them. I expect Funchess to have his moments, and he seems like somebody to target in the daily fantasy leagues. But again, temper your expectations. Did LeSean McCoy get lucky this week or what? McCoy trended on Twitter for a few minutes because of his comments on Chip Kelly, but then the Wells Report dropped and everybody just kind of forgot all about it. Which I guess is the American way. ImageUSA Network ended "Benched" and "Sirens" recently? And Fox got rid of "The Mindy Project" too? They are making it pretty easy to cut the cord. TV is going to be so completely different once games are streamed on demand. ImageAlthough, that didn't work out too well for those of you who bought the Floyd Mayweather and Manny Pacquiao dance-off. At least with that one out of the way, I'll never be compelled to spend money on that again. I think we need to find something thatâs a cross between Mayweather's fighting style and the UFC. Which I guess is professional wrestling. And you know the Ravens stole Williams from the Steelers, too, no matter how much they try to deny it. Don't let any Steelers fan try to convince you Jesse James is going to be better than Williams this year. That ain't going to happen. There will be a sentiment that the NFL Draft could move to Los Angeles. But I can't see it happening. Not unless they want to hold it someplace outside of LA Live. But with the Kings, Lakers and Clippers all expected to make the playoffs next year (well, at least the first two on this list), I don't see how the NFL could swing it. I don't think Tom Brady's legacy is in any danger of being tarnished much how I don't think USC's legacy during the Pete Carroll era was tarnished. I mean, I watched them all work their magic on the field, and that's what I will remember. And you're mental if you think this keeps him out of the Hall of Fame. He's still a first-ballot guy. ImageAnd things look bleak for the Patriots right now, but it's a bad look for the teams who couldn't beat them so their only recourse was to go tattle on them. It's like when you're out playing beer pong with the guys. And sure that one dude is probably leaning over the line when throwing the ball. And yes, he shouldn't do it. But you look like a bigger (expletive) for calling him out on it. You just do.